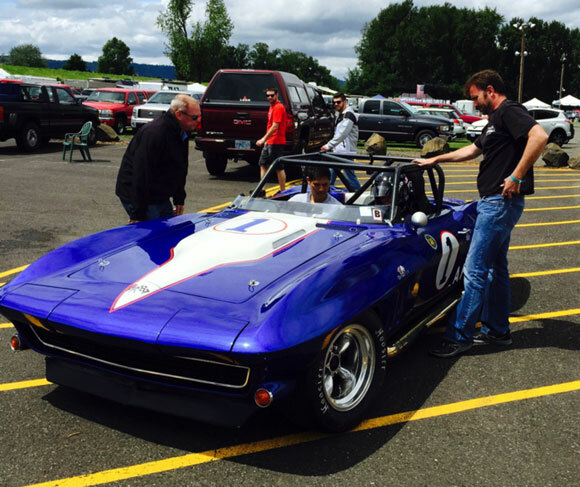 Portland was the first stop on Duntov’s annual 6,000 mile two-race July road trip. This year they brought Tony Parella’s 1965 big block roadster that Ray Evernham and Bill Elliott drove at Indy. Tony had taken the car in on trade and it was supposed to be race-ready. They never are! The car threw a driveshaft at Indy, and backed that up with another DNF at Portland. Four-time Indy 500 winner, Al Unser was the Grand Marshall of the event, and he was joined for the weekend by his son, two-time Indy 500 winner Al Junior. The Unser’s turned out to be great people, and they spent most of the weekend with the Duntov guys. Al Senior even got in a few laps in Tony’s blue roadster. Susie Patterson ran her Devin-MG, and of course it was her first time there, so she was just learning the track. SVRA sponsor Robert Talbot’s CEO, Bob Corliss drove the blue roadster through Saturday, and Tony took it over for Sunday’s feature race as Corliss had to leave early. It was Tony’s first time in the car and he started at the back and turned the third fastest Group 6 time as he cut through the field right up until the differential blew up. It was then on to Road America for the annual Brian Redman event.